Camping at most Arizona State Parks is on a first-come first-served basis, including Kartchner Caverns in the southern part of the state. If you're not the type of person that likes to plan a trip without knowing you have a campsite reserved, don't rule out a visit to Kartchner Caverns. Instead, stay at Roper State Park and take a day trip to Kartchner (Roper State Park is a little over an hour's drive from Kartchner Caverns and is one of the two state parks in Arizona that accepts advanced reservations. Call 928.428.6760 for reservation inquires at Roper). Kartcher Caverns State Park is located 9 miles from Benson, Arizona and 160 miles from Phoenix. The crown jewel of Kartchner Caverns State Park is the Caverns. They were discovered in 1974 by two cavers who didn't tell the property owners of their discovery until 4 years later during which time they secretly explored the cave discovering its amazing variety of colors and formations. During those four years the cavers realized what they discovered needed to be preserved so they approached the property owners to tell them of their amazing discovery. The majority of the world found out about the existence of the caverns in 1988 when the purchase of the property was approved as a state park. It officially opened as a state park in November of 1999. It is estimated that the formation of the caverns began 330 million years ago when a shallow inland sea covered the area. It's rich in history with more being discovered as continued exploration takes place. Palentologists have discovered the skeletons of an 86,000 year old Shasta ground sloth in the caverns, a 34,000 year old horse, and an 11,000 year old bear. There are two different tours available: -Rotunda/Throne Room Tour which is 1/2 mile in length; is about 1 1/2 hours long with tours available year round. Cost of the tour is $18.95 for ages 14 and up, $9.95 for ages 7-13, and free for children 6 and younger. -Big Room Tour which is 1/2 mile and about 1 1/2 hours long. Tours of the Big Room are only done from October 15 to April 15 (it's closed the rest of the year to allow the cave to rest and rejuvenate and so the cave myotis bats can roost) and it is more challenging than the Rotunda/Throne Room Tour; therefore, children 6 and under are not allowed to take it. The cost is $22.95 for ages 14 and up; and $12.95 for ages 7-13. The park itself is open 7 days a week from 7:30 am to 6 pm MST and is closed Christmas Day. Campers need to arrive by 5:30 pm. Park gates close at 6 pm and reopen in the morning at 7 am. The 62 first come first served campsites at the park have electric hookups with water, a dump station, restrooms, showers, and flush toilets available. In addition to guided cave tours, the park features a Discovery Center, interactive displays, a theater with a video program, a gift shop, telephones, vending machines, and an amphitheater. There are hiking and walking trails inside the park. The Guindani Trail is 4.2 miles long, is easy for the first mile, then moderate for the next 2/3rds of the trail, then strenuous for the last section. There is also the Foothills Loop Trail which is 2.5 miles long with a moderate to difficult rating. For a more leisurely walk, there is the Hummingbird Garden Walk on the southwest side of the Discovery Center. The walkway is lined with a variety of local vegetation. Entrance to the park is $5 per car or free with a tour reservation. Camping is $22 per night. The elevation at the park is 4,600 feet. 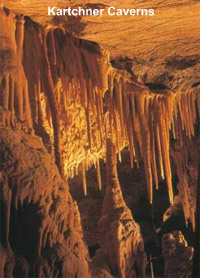 For more information about Kartchner Caverns visit the park's website by clicking here.